Are you looking for a stable kayak for photography? You may already know what to look for, but you may also wonder what questions to ask and what issues you should be aware of. This article will attempt to encompass and summarize the main aspects of kayak photography that you may want to consider when you’re looking to choose a kayak for this demanding application. The photographer needs to be comfortable in their kayak, and not suffer from the typical physiological issues these basic vessels are associated with, which are lower back pain (a symptom know as ‘yak back’), leg numbness, leg cramps, and in extreme cases even sciatica. In order to avoid suffering from these problems, the photographer should avoid being seated in the L position, which is the traditional kayaking position at the root of these problems. Sitting in positions that are similar engenders similar ergonomic problems as well as others that range from increased instability to bad circulation in the legs. Currently, W kayaks are the only ones that offer their passengers to sit in the comfortable and stable Riding position – high, free of back pain, and dry. It is imperative for wildlife kayak photographers to be able to stand up at will, with no need for particular efforts in getting up, standing, balancing and sitting down. Standing up must be possible anytime and anywhere, regardless of wind, eddies, etc. , and this is true even if the photographer is middle aged or elderly and not particularly athletic. Standing up in your kayak is important as means for you to relax, stretch and overcome fatigue, as it’s important for scouting and shooting photos above the grass and vegetation. This obvious, common-sense requirement rules out all kayaks for this matter, except ones from the Wavewalk’s 500 series. Practically speaking, there is no way or reason to dissociate the user experience in ergonomic terms from their experience of comfort based on the kayak’s stability, or lack thereof. A kayak that’s insufficiently stable, as most kayaks are, is by definition and practice uncomfortable and not suitable for photography, and no sensible wildlife photographer should consider using it. Ergonomics isn’t just about comfort, which traditional kayaks offer too little of. It’s also about the user’s range of motion – Imagine yourself seated in a traditional sit-in or SOT kayak, holding your precious camera in both hands, trying to follow with the lens a bird flying above you… Chances are you’d lose balance and overturn your kayak, or stop trying to shoot that bird simply because your kayak isn’t stable enough, and your ability to balance it is limited by the fact that you’re sitting in the L position, with your legs stretched forward. In contrast, the Wavewalk 500 offers you a much higher degree of stability, a better way to stabilize yourself while riding its saddle, and consequently a full range of motion, as you can turn sideways and backward, as well as raise your glance upward and look over your shoulder with no fear of losing balance. Practically, you may not need to travel through such difficult waters, but you need to be aware of the fact that unlike the W500, traditional kayaks of all types offer limited mobility, which could restrict you. Photographers need ample storage space for their photographic equipment, which includes cameras, tripods and lenses, which must be kept dry. This is a problem when all kayaks are concerned, except the W500. This unique kayak offer several times more storage space than any other kayak may offer, and its storage space is internal, meaning that it’s dry and protected from unwanted moisture, such as eddies spraying water on a SOT kayak’s deck, or waves splashing inside a sit-in kayak (SIK). A W500 loaded with 200 lbs offers 13 inches of free board – several times more than any other kayak does. Moreover, since the W500 does not feature hatches for storage but rather single, big, continuous space in the cockpit and hull tips, the photographer using this kayak enjoys unrestrained access to their gear, which isn’t the case for gear stored in kayak hatches. The W500’s storage space offers you to customize it through the use of containers of various size and shape, according to your specific needs. 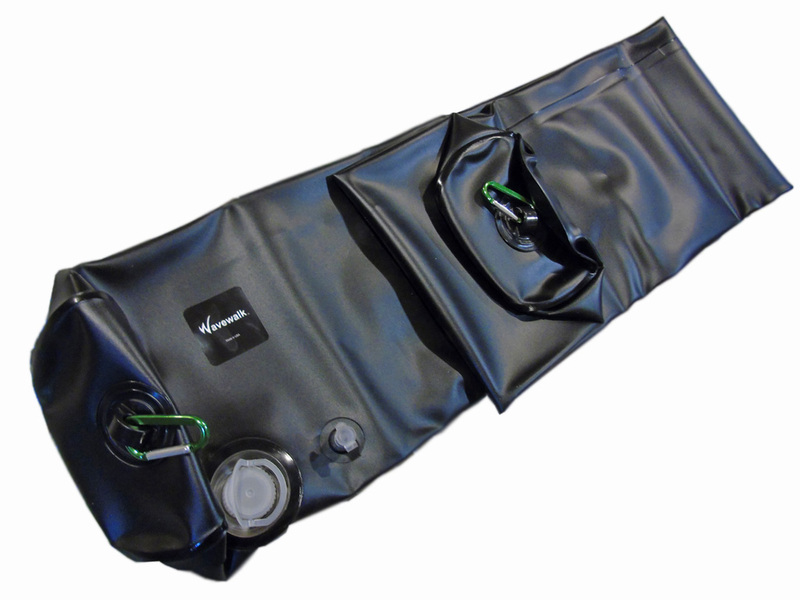 Some W500 models feature a preparation for a cockpit cover, which offers additional protection without presenting any of the inconveniences that spray skirts create. Kayaks need to be car topped, and they also need to be carried to the water and back from it to your vehicle. If you’re serious about wildlife photography, chances are that getting from your vehicle to the water could involve going over a significant distance, and often in difficult terrain. Both car topping and carrying (a.k.a. portaging) preclude the use of typical sit-in, SOT and hybrid fishing kayaks that are designed to offer more stability through sheer size: Such extra-wide kayaks are too heavy to be practical – Some of them weigh 80 lbs, and others up to 120 lbs, and since your photographic equipment can be heavy too (how much does your tripod weigh?…) you’d be effectively prevented from taking trips to places you could easily reach with a W500, which weighs only 60 lbs, and can be loaded with gear and simply pulled by a leash, like a sled, even in difficult terrain. If you don’t like the idea of dragging your W kayak on the ground, outfitting it with a single transportation wheel or a pair of such wheels is a breeze. Kayaks from the W500 series are offered in three standard colors – Yellow, green (teal), and sand (tan, caramel). The green and sand colors blend well with aquatic environments that are popular with wildlife photographers. These colors are also good as base for camo colors and patterns. Camouflaging a kayak is very easy if you use spray paint for outdoor plastics such as Krylon Fusion. Few people use outriggers for kayak fishing, and these accessories are even less popular among people who use kayaks for wildlife photography. In both applications, outriggers impede you, restrict your range of travel, and tend to be problematic in shallow, vegetation-rich water. In sum, Kayak photography and kayak fishing have many things in common, and it’s possible to infer what could work for photography from reading what works for fishing, as well as from watching videos on this subject. You are welcome to visit this website, read customer reviews and articles, and watch videos contributed by clients and produced by us. Please feel free to call or email us with any question you have about photographing from a kayak. We look forward to your questions and comments. How effective are outriggers for your fishing kayak’s stability? An outrigger is defined as a framework supporting a float extended outboard from the side of a boat for increasing stability. In kayaks, outriggers usually come in a pair mounted at the rear, so as to interfere as little as possible with the kayaker’s paddling and fishing activities. Why are fishing kayaks required to be so stable? The first reason is because the kayak’s operator is often busy fishing, which means they cannot pay much attention to balancing their kayak as they scout for fish, operate their fishing gear, and handle a fish they just caught. The second reason is that people who paddle sit-in, SOT or hybrid kayaks do it while being seated in the L position, with their legs stretched in front of them in a way that prevents them from being effective for balancing. This is the reason why the paddle is the principal means such paddlers have for stabilizing these kayaks, and this means that it’s easier for them to keep their balance while they’re holding their paddle and preferably using it for paddling. The third reason is that people who pedal a kayak find it even harder to balance it, as their legs activate the pedal drive from the kayak’s center line, with their feet l moving high over the deck. In this awkward position the legs are prevented from contributing even the little help in balancing that they could have contributed in a paddling mode. This makes the notion of a hands free pedal fishing kayak part of the realm of fantasy (a.k.a. hype). The fourth reason is that some people who believe sit-in and SOT manufacturers’ hype try to fish standing in or on their kayak, only to find out that in reality they don’t feel stable enough, and balancing their kayak comes at a price of a continuous effort, both in physical and mental terms, i.e. micro-adjustments and focus. The fifth reason is that some people have balancing problems resulting from a deficient sense of balance, a neurological condition such as multiple sclerosis (MS), artificial knees or hips, or simply because of old age or just because they’re big and tall. The sixth reason why people look to outfit their fishing kayak with outriggers is because when they outfit it with a powerful motor the higher speed increases the chance of accidents, which calls for improved stability. How do outriggers work to increase a kayak’s stability? An outrigger’s float is a buoyant object who’s much lighter than water. As such, an outrigger can resist downward pressure that’s pushing it into the water. Being attached at a considerable distance from the kayak’s longitudinal center line gives the outrigger’s float a mechanical advantage over whatever that pushes the kayak’s main hull downward on the same side, such as the kayaker’s own weight. This mechanical advantage enhances the outrigger’s effectiveness in stability terms. I other words, the bigger the outrigger’s floats are and the further away they’re attached from the kayak’s center line, the stabler that kayak is likely to be. In contrast, small outriggers that are attached close to the kayak’s hull, or outriggers that are part of the kayak’s hull and are deployed sideways by a lever system have a small effect on the kayak’s overall stability. How effective are outriggers in terms of increased stability? 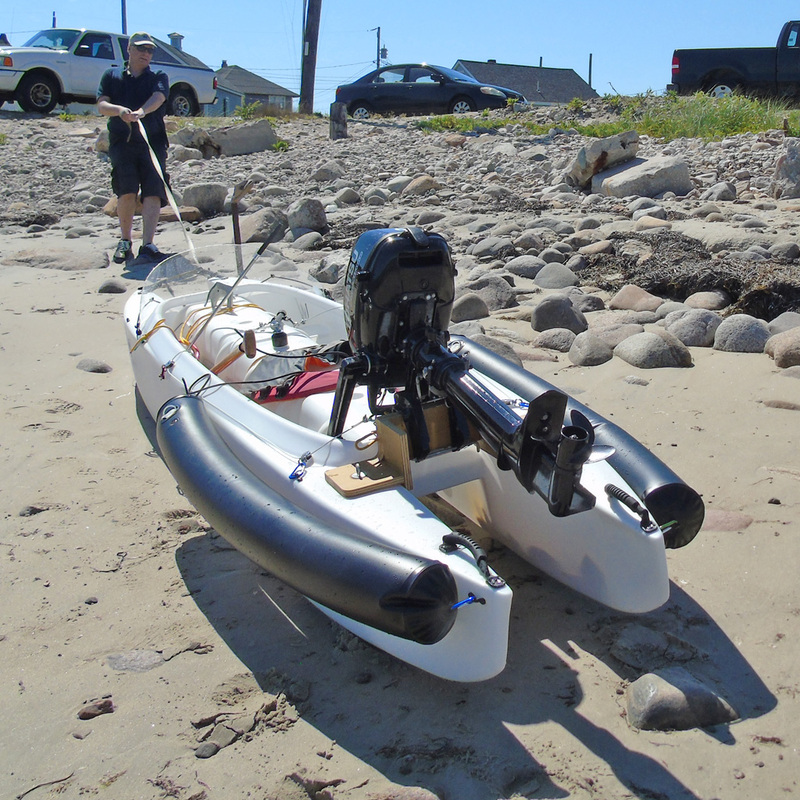 Folding outriggers that are integrated into the rear end of the kayak’s hull and deployed outward by means of a lever have the same effect as small outriggers. Such kayak offers little stability when its folding outriggers are not deployed outward, and when its outriggers are in the open position the overall stability it offers is comparable to the overall stability offered by a regular wide SOT kayak with no outriggers. This means that if you have no intention of fishing standing on the deck of a big regular fishing kayak, you shouldn’t even consider a kayak that features outriggers that are integrated into its main hull, even if the manufacturer of such kayaks is seen stating in a promotional video that their product offers (quote): “the buoyancy equivalence of an 8 ft wide boat” (end quote)… BTW, the beauty of such a statement is that because it’s so obviously and ridiculously false, it probably fails to mislead anyone. Light rigs – Outriggers built from thin, small-diameter aluminum tubes might bend or snap when exposed to strong pressure. This is especially true if the floats are big and located at a big distance from the kayak itself. Outriggers made from thin steel rods can bend, and outriggers made from thin wooden beams can break. Outriggers poorly attached to the kayak could get torn out of their place in case of an accident. Can outriggers create problems in paddling and fishing? Typical outriggers are several times shorter than the kayak’s hull itself. This means that as the kayak moves, the outriggers move at speeds that are many times higher than their own hull speed (Froude number). This generates a disproportionately large amount of Residual resistance (Rr) as well as extra Frictional resistance (Fr), and the kayaker feels their combined effect as extra drag on the kayak, which makes it slower and much harder to paddle. But this is not the end of the drag story, since the outriggers also generate their own wakes, which interact with the wake generated by the kayak’s main hull in a manner that increases turbulence and works to further increase drag. This additional unwanted effect is especially strong in outriggers that are mounted close to the kayak’s hull. And if this wasn’t enough, outriggers also increase the kayak’s exposure to the wind, and this tends to reduce the kayak’s directional stability. In other words, it’s almost impossible to paddle a kayak outfitted with outriggers if you don’t outfit it with a rudder as well. But since rudders reduce the kayak’s speed by 10% in average, it’s possible to say that a kayak outfitted with outriggers is not one you’d like to paddle simply because paddling it would prove to be to hard for you, unless you’re out for a short trip on flat water. Let’s face it – fishing kayaks are the heaviest kayaks out there. Many fishing kayaks weigh over 70 lbs, and the most barge-like of them weigh up to 120 lbs. Such size already makes it impossible for many anglers to car top their kayak, and forces them to transport it on a trailer, which clearly defies the purpose of kayak fishing in yet another way. A pair of outriggers can weigh over 20 lbs, which transforms even a kayak of reasonable weight into a barge in terms of transportation and carrying it to the beach and from it back you one’s vehicle. Kayaks equipped with outriggers simply don’t move as well as other kayaks do. This is true for shallow water with obstacles, seaweed or grass, for rocky beaches (‘rock gardens’), and for moving water where the outriggers make the kayak harder to steer and control. When you fish out of any boat including a kayak, you strive to get out of your way any object that could interfere with your fishing lines, whether when you cast, reel in a fish or land it. Outriggers are large size and intricate structures that are located close to the kayak, and as such present a constant threat to your lines – In fact, people who fish out of kayaks with outriggers are always careful to cast as far as possible from their kayak’s rear end, and since most kayaks already present typical restrictions on anglers, any additional limitations are not welcome, by definition. What is the best type of outriggers for my fishing kayak? Ideally, you’d want your kayak outriggers to be as long as possible, so they generate as little drag as possible when the kayak moves in the water. After all, you want to go places, which is why you got a kayak in the first place. You also want the outriggers to be as big as possible so they have more buoyancy, and thus work better to provide the required additional lateral stability. As far as you’re concerned, outriggers are mission critical! You want the outriggers to be attached to the middle section of the kayak, so they work to provide stability on its sides and not just in its rear, where you don’t necessarily need it – As they say: Location, location, location! You want the outriggers to be as small as possible, so they don’t weigh too much. Kayaks are supposed to be lightweight, remember? You want the outriggers to be attached to the kayak’s rear end, at a good distance from you, so they won’t interfere with your fishing activities… After all, fishing is what got you to buy the kayak in the first place, right? Bottom line: There’s no such thing as ideal outriggers, which is why you need to carefully weigh the whole idea before you go forward with it. Are outriggers even necessary with a W500 kayak? Otherwise, people who suffer from a severe balance deficiency that prevents them from sensing the kayak or reacting effectively (e.g. multiple sclerosis) should consider the benefit of adding a pair of outriggers to their W kayak. Anglers who want to stand on top of a poling platform stretching over the cockpit of their W kayak may gain stability by adding outriggers to their setup, but they would gain more stability, convenience and safety by standing inside the cockpit, on the bottom of the kayak’s twin hulls, with their feet located below waterline – like all other stand up W kayak anglers do. The W design works better than anything else as far as stability is concerned. When it comes to motorizing (i.e. outfitting the kayak with a powerful outboard motor), outriggers might complicate steering because of the high speed involved, meaning that an outrigger hitting a wave at 8 mph would affect both the kayak’s directional stability and its lateral stability (balance). This in itself is an unwanted effect that could have safety implications. As for outriggers that stay out of the water, their effect is limited to begin with, since they are rather ineffective for adding initial (primary) stability, and by the time they come in contact with the water and start preventing the kayak from further tilting (i.e. provide secondary stability), the kayaker may have already lost their balance and gone overboard. Attaching large size flotation modules to the kayak’s sides seems to be a preferable solution. Outriggers are impractical for paddling a W kayak in tandem, because the presence of the outrigger near the stern would restrict the motion of the rear paddler’s paddle. Everything is going great. I haven’t tried my W kayak with the motor on yet, but last weekend I already installed outriggers that have 60 lbs of flotation next to the motor mount. Looking forward to a full test run next weekend. Will send pictures and a report.